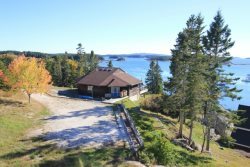 Ledge Cottage is a gorgeously built oceanfront home off the Goose Cove Road in Deer Isle. The home has many high-end details including beautiful hardwood flooring, cathedral ceilings, gorgeous and colorful artwork, an abundance of windows to bring the view and daylight inside as well as many other “bells and whistles”. The main floor of Ledge Cottage is comprised of the living room, kitchen and full bathroom. The living room of the home has a large stone fireplace as the centerpiece. The living room has a large and comfortable, sectional sofa which wraps around the stone work of the chimney, to make rainy afternoons on the couch a dream at Ledge Cottage. The home has a small dining area in front of the sectional. The views from this area of the home are superb. 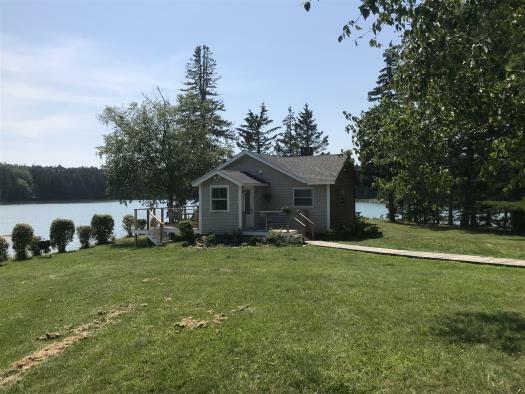 Ledge Cottage has a well-kept kitchen with granite countertops, red cedar cabinetry, a soapstone sink and new appliances. The home is wonderfully decorated with an abundance of bright art pieces. The second floor of the home has a queen bedroom with soaring ceilings and gabled dormers. 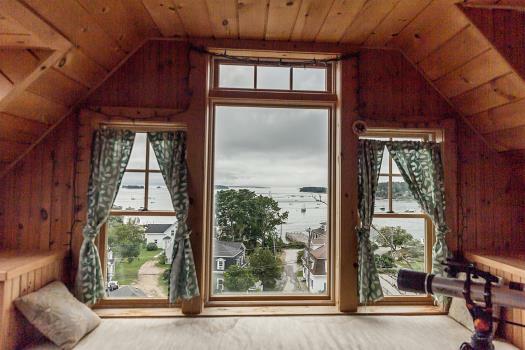 A seaside balcony with french doors provides lovely views of the Penobscot Bay from the bed, benched window seat or the desk space. There is a full bathroom with a shower stall and a vanity with two hand sinks. The second floor of the home also includes a meditation room. The ground floor of the home is a finished out daylight basement. This room is furnished with a full size bed and enjoys water views. There is a nice sitting area, a free standing wardrobe, as there is no closet on this floor and beautiful artwork all around. This floor of the home also has a half bathroom with the laundry closet which includes a washer and a dryer. 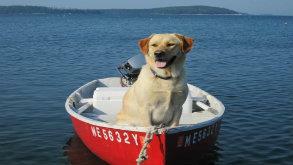 The home sits atop a hill overlooking the Penobscot Bay. There is a lovely wraparound deck with many wonderful seating options to take in the views of the bay. The homeowners have been working to clear the hillside to make the access to the water a bit less challenging. The hillside is steep but can be maneuvered. The hillside is a beautiful combination of tree, moss, ledge and sea. 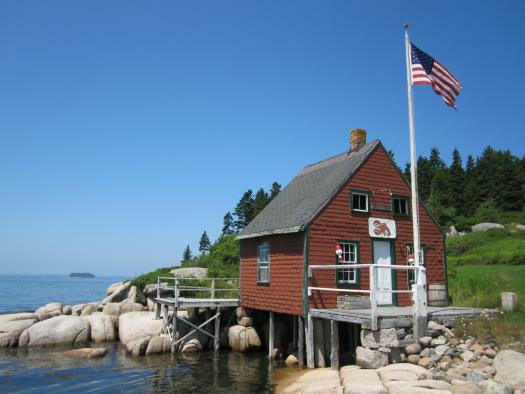 Ledge Cottage is a wonderful home in a very private setting. 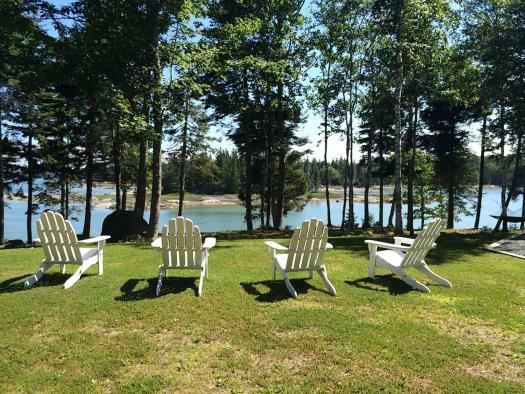 There are many glorious features that make this the perfect Maine coast getaway. 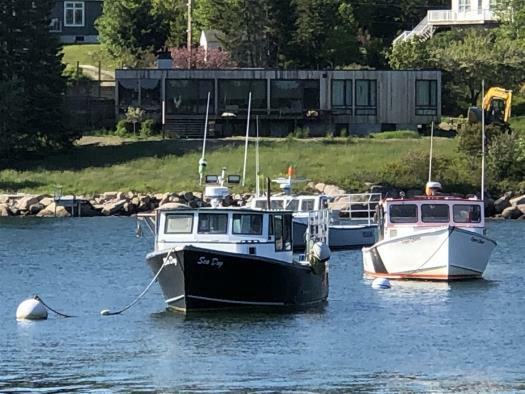 Call us today to reserve your time in this beautiful seaside home.